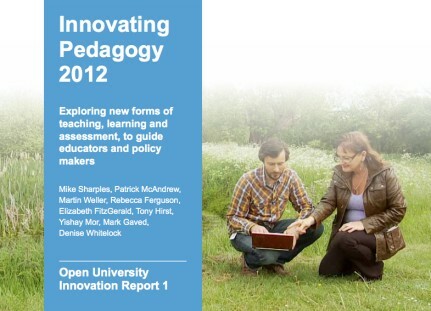 In the spirit of the NMC Horizon reports, a group of scholars at the Open University has prepared a thorough and thoughtful analysis of what is coming in pedagogy. The 36 report is available here, and though its attention is focused upon post-secondary teaching and learning, there is much here that is highly applicable to those of us seeking to be more informed about coming trends in K-12 pedagogy. We acknowledge inspiration from the NMC Horizon Reports as well as other future-gazing reports on education. Those explore how innovations in technology might influence education; we examine how innovations in pedagogy might be enacted in an age of personal and networked technology. the future of learning lies in a student-centered, web 2.0 empowered, networked connectivism. This is the New Culture of Learning, and we owe it to our own life-long learning and to our students to study this mode closely and exploit every opportunity to advance it. Note that in nearly all of these six, technology is essential, particularly the power of the internet. Personal inquiry learning and badges, of course, are ancient, but are both accelerated dramatically by learning online. Dynamic books can also enable a more social form of study, with a group of students working together on reading, annotating and comparing one or more texts on the same topic. Each student can see the text on their e-book reader and also the annotations and comments on the text being created by the other students….The activity requires all the students to compare and discuss their reading and to explain the concepts to each other. A logical extension to this mass sharing of comments is for students to write additions to textbooks, offering their own interpretations, explanations and examples, which they can then publish alongside pages of the book. Book publishers would need to set up a simple system of publishing and reward for such ‘book extensions’. The new opportunities being made available by the transformation of the textbook into a flexible vehicle for inquiry, interaction, collaboration and creation, is, I think, very exciting and coming very fast. If there is one thing for schools to begin to invest in, it is the expansion into these new formats. Unfortunately, the report provides only a few links and resources, two of which are just new vendors of these developing tools, Dynamic books and Thuze Learning. Anyone using the Internet goes through a process of learning about the content, tools and people they encounter. This incidental learning can develop into a more structured process, as is the case when someone works through a series of Open Educational Resources (teaching materials freely available on the Web). ‘Badges’ offer a way of accrediting this learning that takes place outside formal educational institutions. More about badges is available at the Mozilla “Open Badges” site. As the father of two boys obsessed with Minecraft, I was also interested to see that this is a growing element of that universe, as demonstrated here. About MOOC’s, which have been quietly brewing over the past four years but, to this reader’s eyes, have exploded in the past 3 to 6 months, are the brainchilds, at least in part, of George Siemens and Stephen Downes. 21k12 readers who have made it this far into this long post owe it to themselves and their learning to subscribe to the Stephen Downes daily newsletter, OL Daily, if they don’t already. (My hat is tipped to Chris Bigenho for introducing me). Massive open online courses (MOOCs) are attempts to create open access online courses that provide no constraints on class size. In contrast to open courseware, MOOCs are selfmanaged by groups of learners and teachers and run over a defined period of time, typically 6-12 weeks. MOOCs are open to all, have no formal entry requirements, and can provide a framework for ‘badge’ based recognition. They may support opportunistic ad hoc engagement with individual activities or resources, as well as a more disciplined commitment to the course as a whole. MOOCs can be purely informal offerings, or opportunities for independent learning aligned to a formal course, or semi-formal courses offered by an institution for informal certification. MOOCs are an enormous subject in their own regard, but note for these purposes that one of the most important and interesting debates about MOOCs happening today has to do with the value placed on connectivist learning in them. In other words, can a fairly hierarchical distribution of knowledge, as happens in most college lecture courses, wherein the expert professor is dispensing wisdom listening students, transferred to the web count as a MOOC? Or, is it integral to the concept and definition that these be structured as learning experiences such that each participant is, at least in part, charting his or her own journey toward understanding, spreading outwards from the course into wider webs of related knowledge and, in turn, sharing back inside the MOOC that learning? Seamless learning is when a person experiences a continuity of learning across a combination of locations, times, technologies or social settings. Such learning may be intentional, such as when a learning activity starts in a classroom then continues through an informal discussion with colleagues, or online at home. access to learning resources, encompass physical and digital worlds, engage multiple types of device, and integrate different approaches to teaching and learning. Although seamless learning does not depend on personal internet technology such as a tablet computer or smartphones, these devices can enable a fluidity of learning activity. Seamless learning can best be seen as an aspiration rather than a bundle of activities, resources and challenges. In a 1996 paper introducing the concept, Kuh proposes that what were previously distinct experiences of learning (in-class and out-ofclass; academic and non-academic; curricular and co-curricular; on-campus and off-campus) should be bound together so as to appear continuous. Institutions can take a deliberate stance to support seamless learning by encouraging students to draw on supplementary learning resources outside, to see themselves as continuous learners, and to use students’ life experiences to make meaning of material introduced in classes. As the authors note, this is a relatively more abstract concept than most of the others on the list, (an “aspiration”), and that too heavy-handed an approach on the part of educators to structure students’ “seamless learning” is almost certainly counterproductive and a formula for disaster. But, assisting learners in developing their “personal learning environments” is essential to this theme of networked connectivism, which is the key value in this section. Students are adopting technologies and then adapting them to support their own self-directed learning. For example, 1 in 10 high school students have Tweeted about an academic topic. 46% of students have used Facebook as a collaboration tool for schoolwork. Parents are supporting their children’s personalized learning journeys. 64% of parents report that they would purchase a mobile device for their child’s academic use at school. There is a gap in offerings between what schools offer and what students want to learn. As a result, students are looking outside of the classroom to meet their personalized learning goals. For example, 12% of high school students have taken an online class on their own, outside of the classroom, to learn about a topic that interested them. In math and science classrooms where students and teachers direct learning supported by technology, students’ interest in a STEM career is 27%, compared with 20% for students in traditional math and science classrooms. A central aspect of such personal inquiry learning is that students, individually and collectively, should take ownership of the inquiry process. For this to happen they should gain a clear understanding of the process and their agency in acquiring scientific knowledge. They should come to know what kind of questions are scientifically appropriate, how these can be framed as valid inquiries, who they can find and trust as scientific informants, what kind of studies are appropriate, why it is important to collect reliable data, how this can be analysed and presented as valid evidence, and how the results of an inquiry can be shared and discussed. A typical inquiry might start with an online class where a tutor helps students to form and refine their questions, continue at home or outdoors with the students collecting and viewing data, then return to the formal setting to share and present results. If learners are expected to engage in learning processes modelled on scientific practices, they need tools that offer them investigative powers equal to those of scientists. Such inquiry toolkits are becoming more affordable as mobile phones become scientific instruments equipped with embedded sensors, camera, voice recorder and powerful computer. For the future, there is an opportunity to promote widespread public involvement in scientific investigation bycombining citizen science with inquiry-based learning. Through social web technologies for organising groups of people with shared interests, volunteers could form teams to propose and investigate shared questions, by methods that range from online psychology experiments and surveys, to observations of the natural world. the inquiry process, then people without formal scientific training will be able to act as research teams and explore the science that affects their lives. Programs and resources from both Berkeley and Stanford useful for K-12 educators in advancing such personal inquiry science learning are helpfully provided. Rhizomatic learning invokes the biological metaphor of a rhizome where the stem of a plant sends out roots and shoots, each of which can grow into a new plant. Rhizomes resist organisational structure and have no distinct beginning or end; they grow and propagate in a ‘nomadic’ fashion, the only restrictions to growth being those that exist in the surrounding habitat. Seen as a model for the construction of knowledge, rhizomatic processes hint at the interconnectedness of ideas as well as boundless exploration across many fronts from many different starting points. Dave Cormier has done most work on this as a theory, and he suggests that rhizomatic learning is a means by which learners develop problem-solving skills for complex domains. For the educator, supporting rhizomatic learning requires the creation of a context within which the curriculum and subject knowledge are constructed from contributions by members of the learning community, and which can be reshaped and reconstructed in a dynamic manner in response to changing environmental conditions. As Cormier puts it, “the community is the curriculum”. One advantage of a rhizomatic approach is that it is more ‘network native’ than many other pedagogic concepts. It promotes peer support, learner responsibility and an appreciation of the power of the network. The authors point out that as abstract or overly esoteric the term “rhizomatic” may be, much of the online gaming community is, without being aware of it, rhizomatic in its practices, and I see this daily in my own living room, observing my gamer sons. Research with adolescent gamers by Kathy Sanford, Liz Merkel & Leanna Madill at University of Victoria looked at how how gamers’ experiences revealed the complex learning systems in which they contributed, created, and participated in their gaming communities. There is “no fixed course” in gaming, and that their subjects actively blurred the boundaries between producer/consumer, teacher/learner, and individual/collective. An online course in educational technology by Alec Couros is cited as an example. All six of these sections are all parts of a whole: the exponentially enhanced power of personal, inquiry driven learning connected skillfully to networks. But this skillful networking is not intuitive, and isn’t altogether mastered by digital natives: we have to help our students, and help ourselves, develop these skills to make the most of this new learning. The other important emphasis in the Open Univeristy report has to do with an incredibly important, and incredibly risky, aspect of the coming educational transformation: the role of technologically amplified assessment and tracking of learning. Two sections, 4 and 9 from the list at top, go hand-in-hand. About Assessment for Learning, the authors say the potential impact is “high,” and that its timeline is the next 2-5 years. We have the opportunity to move beyond measuring the results of learning and taking snapshots of students’ performance towards integrating assessment fully into the learning process. The most immediate benefits can be made from giving students advice for action on how to narrow the gap between their current and desired performance. In this, computer-based assessment is embedded into the teaching materials, with constructive feedback provided immediately to learners and teachers then used as a basis for addressing misconceptions and providing supplementary teaching, perhaps followed by re-assessment. The discussion includes fast-developing new applications of technology, such as those which offer automated scoring and feedback for essay writing, allowing students to be greatly aided in their writing process, and gaming formats, where students get the kind of constant feedback of points in exactly the same way they do in many video and computer games. Signals gathers data about students’ characteristics such as academic background, effort as indicated by engagement with online elements of the course, and performance as reflected in their grades. Information about preparation, performance and effort are combined to generate signals. The opportunities and advantages here are more obvious and clearly laid out: we use online feedback systems and computer analysis for much else in society– why wouldn’t we want to accelerate our students’ learning, and amplify our educators’ opportunities to assist their students, with these systems? Such methods must be used with caution. They cannot provide the precision or the insight of a human response and there is a danger that giving continual feedback will channel a student into continually adjusting performance to match the response, rather than planning and then engaging in a fluent piece of work. Rather than the student just viewing the feedback or learner model, a more useful approach may be to have the student and the system (and in some cases a human tutor) cooperate to produce an agreed representation of the student’s skill, knowledge and performance. There is a thin value proposition of the promise of educational technology, using these tools as a way to automate and teacher-proof teaching while having the effect of creating a more standardized curriculum (which will most likely be tied to a standardized assessment) that may allow students more ability to proceed at their own pace but will, in the end, be more restrictive in terms of student ownership over their own learning. That is a profound failure of the promise of educational technology. … reviewing OU’s Innovating (is there any other kind lately?) Pedagogy Report, with report and related links amply embedded. Have I read it? No, but hope at least to skim it on the fly and/or review commentaries. The OU brand does entice more than Horizon (report for K-12). The report is tech, connectivism and personal learning oriented ~ all familiar territory. Rhizomatic gets “unsure but could be high.” Kuh’s “seamless learning” (bundling what were previously distinct experiences and modes of learning, 1996) is new to me and now added to my own “learn more about list.” Assessment and especially analytics are still the dark side. Ignore the implications at your own peril.